Kids, this week, we’re going, as Oprah Winfrey told her audience in Season 25, to the other side of the world! Imagine Oprah’s excited voice, saying: “You’re going to Australia!!!! !” We are going to meet the very interesting and talented Gemma Wiseman, of Greyscale Territory - Poetic Songlines. As Gemma explains in her About page, songlines are paths across the land, along which the Aborigines find their way across unknown terrain, by knowing and remembering the land’s song. The literal meaning of songlines is “to sing the trail”, to remember the physical landscape in song. This has always held a wonderful mystique for me. So come along. Let’s sing our way home along some beautifully poetic songlines. Poets United: Gemma, we have much in common! I have been browsing your profile info, and your many sites, and am so looking forward to this visit with you! Okay, the very first question I have to ask, since I am an Oprah fan, is did you see Oprah Winfrey when she was in Melbourne? Gemma: Would you believe, the first time I saw Oprah here was when she climbed the Sydney Harbour Bridge in New South Wales…and I saw the event on TV! Oprah has done so much beyond her TV show! I can never forget her support of a girls’ Leadership School in South Africa. A wonderful humanitarian! Poets United: Would you like to tell us something about your childhood? Poets United: Gemma, how sad. All of it. My dad died of a heart attack, too, when I had just turned thirteen. Gemma: For many years I felt stricken with guilt because I had begged him that morning to take us for a walk. He was reluctant because he said he felt tired; but he gave in to my request. From then till I was about 15, I barely spoke a word. Poets United: Sad years. You must have felt so alone. Gemma: Saturday afternoons were my special time for dreaming on a swing, a swing Dad made for me. Sundays I found to be a great opportunity to escape – to Church. I wanted to be with people, to break my bonds of shyness, to sing. By the time I was 16, I was an active member of everything associated with the Church, including a musical group – 3 girls singing + 3 guys playing instruments. Family outings usually involved my aunts, who looked after me occasionally on weekends. Holiday time usually involved a train trip with my mother and brother – a round trip. We didn’t get off at any station along the way. There was little variation of these routines until I was 18. That was when I moved out, rented a small semi-detached home and supported myself working part-time on the Sydney Hoyts theatre circuit while attending Sydney University. Poets United: Good for you! You are a true survivor. Did you begin writing as a child, like so many poets? Gemma: My “locked” lifestyle – no friends were allowed home and the TV was strictly for my parents (still in black and white mode) – prompted me to seek alternative entertainment. My friends included the voices in Little Nipper – my cream coloured HMV radio with the “cute little dog listening to music” emblem - and the voices in my books. I wanted to find my voice, my identity. I think my first writing began before I began school. I do know I loved shaping words when I was very young. Gemma: Songlines resonates for me in many ways…a slight play on ley lines, the energies of the earth and the sense of ancestry implied in the Aboriginal Dreamings of Australia, where the original life still lives, still breathes from the Mother Conscience of the earth. I have not seen Whaledreamers, but I believe that there is a legend about singing in the whales in Scotland. In fact, I am sure I read a novel about a young boy living on an island near Scotland who had the skill of singing in the whales. (I was quite young when I read the book.) 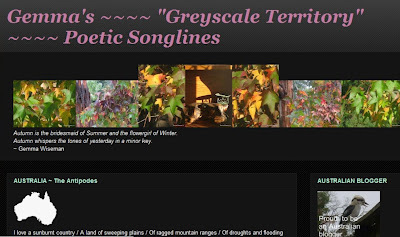 I would like to believe that my blogs, especially my Greyscale, “sing in” those who need to find the energies of beauty and then return to their own seas, taking a little with them. Poets United: I love that description, Gemma! “The Mother Conscience of the earth”. And you definitely sang me in! You have written that you “found Paradise in northern Tasmania,” then Paradise was broken, everything lost. I can tell there is a story there, if you would like to share a brief overview. 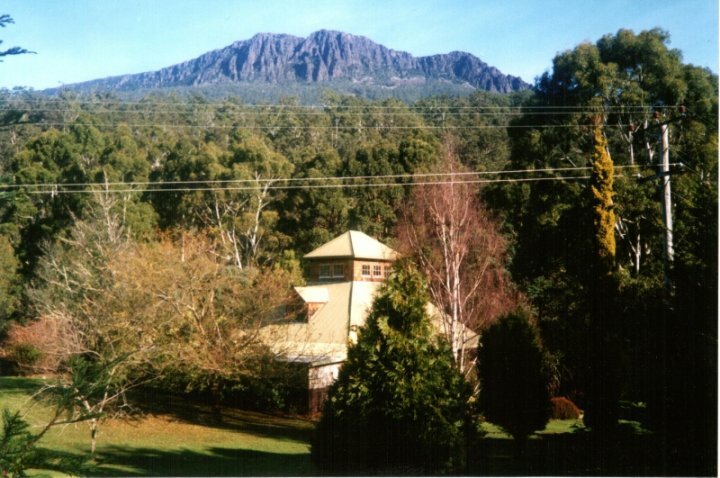 Gemma: The north of Tasmania was an Eden land for me. There was a lake on our property where Merlin the platypus played. Rhododendrons of every variety known burst like living jewels each November; one section of the property had an English garden. We had our own mini enchanted forest on our own mountain. Shari, our beautiful collie, would lead guests from the carpark to the little tea room. The “he” in my life was a wonderful storyteller, creating a series of stories round Zanzibar the Wizard… One late summer, the Hobart group Alchemy played their haunting songs in our garden. Beautiful sunset skies fired the nearby peaks of the Western Tiers.... I flew out of Tasmania late one afternoon, into a sunset, alone, and life had to begin again with almost nothing in Melbourne…I tried not to feel bitter…From time to time, I add to my blog Zanzibar’s Songlines, his stories…my way of turning deep scars into music. Poets United: Sigh. I lived a similar joyous Eden, and its loss. I know how missing it lives within one’s heart forever. But at least we had that time! I will check out Zanzibar's Songlines, for certain. And now you live in Melbourne? Gemma: My life is a struggle financially because I am supporting two of us. I am not so young as I would like to be. But I love writing and photography; and I am so grateful to be living near the sea. 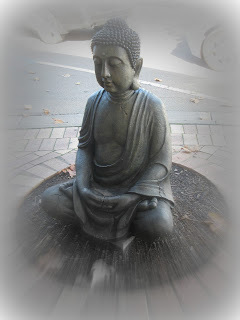 (I try to capture a sense of this world in my Mornington Peninsula Daily blog. Yes! I have many blogs! Like facets of my life!) The clouds of doubt and frustration melt away. Perhaps I attract those who depend too much on me, draining in a personal life. We have a beautiful, grey, fluffy cat who simply wandered into our lives. She has been aptly named Shadow. I am sure that she is some old soul who is an expert at tuning in and healing. Poets United: In your job as a teacher, what grades do you teach? Do you encourage your students to write poems? How do you make poetry fun for them? Gemma: I teach secondary students, mostly the upper secondary students. My subjects include English, History, Geography and electives Myths and Legends, History Mysteries and Media. The last 3 subjects I created for the school’s curriculum. I have encouraged the students to write poetry by integrating other skills. One senior class of mostly boys were “not into poetry” but loved music. There was the key. We turned a Bruce Dawe poem into a “song” – spoken as a group with guitar accompaniment. It worked. One student played some classical music on the piano while a Bruce Dawe poem was being read aloud. It created a wonderful tension of sensations. Poets United: That sounds brilliant, Gemma! 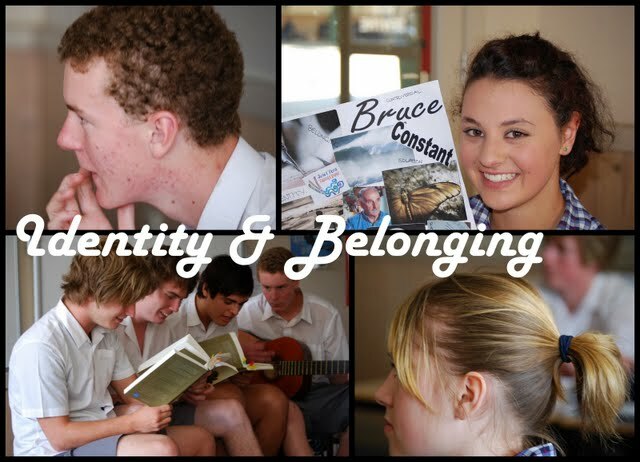 Gemma: I also created a collage of the students enjoying Bruce Dawe. They were required to create a collage of his ideas. We worked in tandem. 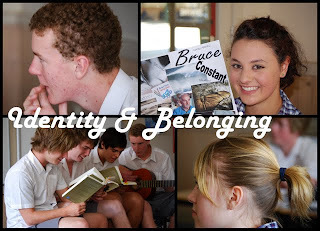 Poetry blogs have been created linking up to my Teen Waves blog, the central blog where all students link. Some students maintain their link after leaving school. Teen Waves is slowly evolving, but it is happening. Poets United: What creative and inspiring projects! The kids are so lucky to have you for a teacher! Did you have teachers who encouraged your writing as a child? Poets United: Who - or what - would you say has been the single biggest influence on your writing? Gemma: The biggest influence on my writing is the time I take to notice the little things around me and how long it takes me to grab the camera to capture the moment. Then I can select the time to reflect on the photo and write. Poets United: Seeing the "little things" is a wonderful gift! Do you have a favourite poet? Gemma: Too difficult to isolate one poet, but I love the colourful, psychological drama inherent in T.S.Eliot’s poetry, the soft whisper of the divine in Emily Dickinson’s and the brash young wit in Michael Dransfield’s. Finally, I love the poetic veil in Thomas Hardy’s novels, but strangely don’t like his actual poetry at all – it seems superficial. If you could imagine a fabric, a Bayeux Tapestry of these poets’ styles giving ambience to a room where you may be reading my poetry, you will probably feel some connecting strings. Poets United: How about a favourite poem, written by you? Poets United: How absolutely lovely! Gemma: But there is one poem I penned when days were grey on first coming to Melbourne. Desperately I was seeking the friendship of light, somewhere in my wanderings by the Yarra River of inner Melbourne. Whenever my days seem smudged, I return to the hope in this poem. Poets United: This poem is riveting. “Old Dreamings”...... I remember reading it on your blog and being blown away. Have you ever lived a great adventure? Gemma: My biggest adventure was a trip to Canada’s prairie country in Autumn, seeing the wondrous “other world” landscape round Drumheller in Alberta, and then spending a day walking through time at the amazing Royal Tyrell Museum. There was also a special moment when my guide stopped the old Dodge right in the middle of prairie grasses and we danced (yes danced) within the songlines of grasses, radiant blue skies and a smiling Autumn breeze . Poets United: Oh, I love that mental image. Magical! How did you come to the blogging world? How has it impacted your writing? Gemma: I came to the blogging world by viewing computers as the enemy. I loathed them. Poets United: Me, too! I resisted. My boss insisted. Now I bless him for it. Gemma: When school reports became computerised, I had to face the enemy! Me David! IT Goliath! Suddenly David saw possibilities in just one small stone. Goliath now carries my luggage from blog to blog. It’s a good arrangement. Each of my blogs is like a file of all that I am. Not sure if blogging has impacted my writing; rather my writing has stormed the possibilities of blogging. Each of my blogs is like a file of all that I am. There is even a blog – AuraGem’s Painterly Songlines - highlighting lesser known paintings and digital art. (I love art! Maybe I should have been a painter too!) For each piece, I write a poem trying to convert the music of the artwork’s spirit into words. Poets United: Maybe you should give art a try!!!! You have a painter’s eye, for certain, to go with your poet’s heart. And, kids, check out Gemma's other blogs. She has at least a dozen of them, Gemma's Earth Gems,(daily small stones, as meditations), and others, showcasing her interest in poetry, art and photography, a wealth of creative accomplishments. Gemma: I have always loved the beauty of small things, the secret gems of this world waiting to be noticed. I love the feel of early morning light and the taste of salts dancing on a sea breeze. Often, at weekends, I walk the beach – nearby Dromana beach if time is limited or further south London Bridge if I feel like a walk on the wild side of the peninsula, or a number of beaches if I can steal some precious hours from my busy lifestyle. My favourite beach is a winter beach when wind and chills play havoc, and the summer crowds are huddling somewhere else. Poets United: Me too. Deserted wild winter beaches are the best. Gemma: I love to knit scarves which take on an identity as I knit. No one scarf is ever the same. I love to read about the strange features of this world…an underwater waterfall just off the coast of New South Wales. I love listening to non-mainstream music. Grunt, a Pigorian Chant fromSnouto Domoinko de Silo and performed by the Ad Hog Camerata, is still one of my favourites. Who would believe that sincere pigs from some ancient farmland could produce Pig Latin in such an entertaining way. All of these interests (and many more) are small things, thankfully slipping beneath the commercial radar. And that makes them personally special! Poets United: So fascinating, Gemma. I don’t want this conversation to end! What dreams do you have for the years ahead? Gemma: If you had asked me in my yesterdays, I would have answered that I would like to earn my living as a writer, escaping the munchings and crunchings of dutiful timetables and the cruel Monday morning alarm. 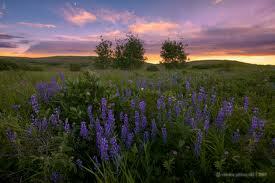 I dream of being a little more financially secure than I am; that would ease many burdens and heartaches. Yet, now I feel that from within the concentration camp of necessity, the yearning creative voice reaches other similar souls. There is no audience without empathy, and life needs and thrives on the spark of struggle. I do love making a difference in the lives of teenagers; I do enjoy reeling in their love of Shakespeare and poetry; I love the surprise, the disbelief on their faces. I guess what I have now is my dream. Yes! I’ve convinced myself. My dream is now. May it linger. My dream is now. May it linger. Poets United: Yes. May it linger. I LOVE the peaceful figure in this photo! Do you have any wise words for beginning writers? Keep your mind focused on your own heartbeat and your own voice. Walk proudly in your own personalised, maybe monogrammed, moccasins. Begin… and begin again… with these ideas in mind before writing. Poets United: Such wise words! Anything else you’d like to share with Poets United? Gemma: Happiness is whatever , whenever and whyever you will contentment to be. Poetry verbalises the textures and rhythms, the shadows and light of happiness, inviting others to connect and then to shape the music, the songlines of their own contentment. Poets United: I feel like I have just spoken with a shaman. Thank you, Gemma, for showing us life through your eyes. We are so lucky to have you at Poets United. And this, kids, is why doing these interviews is a labor of love for me. Such lovely, lovely stories. Such beautiful, beautiful people. Week after week, as all of our good hearts are revealed. Sigh. As we sing our way home along the ley lines crossing this planet, Gemma has given us much to reflect upon. Isn’t it true that the people behind the pens are some of the most interesting folks around? Come back and see who we talk to next. Who knows? It might be you! What a beautiful interview. Reading it feels like a spiritual experience. Gemma, you have taken the pain of your life and turned it into beauty, art. Your shyness and inability to speak when you were young has blossomed into a profound voice. So glad to know more about you...I feel blessed. What a warm, serene and inspiring interview with Gemma. Gemma, you are a multifaceted gem. You are speaking your truths, and you are a shining light/beacon showing what it is like to emerge as a captivating butterfly. Thank you for sharing yourself and your experiences with the world. Ladies...you both have my thanks for a wonderful interview. I love that you are not only a survivor, Gemma, but a tenacious and loving one who seeks out every joy in life and soaks it up! As a beaten-down child myself, I know how hard the journey has been for some to find our true selves and believe in them entirely. Though I've been offline for a while, I've always found your blog a thoughtful and serene place to visit with its beautiful haiku and photography. Expect to see more of me! Sherry, another fine interview from you here. Gemma, I enjoyed reading about your life, from the time of your childhood up until today. I definitely agree that the dream is now. We have to live it now as our life exists for us. I do love Australia, by the way...really loved Tasmania, your 'Eden.' Would return again in a heartbeat. I am more than a little overwhelmed with these comments and feel very humble! (In fact, there's been a few tears!) Thank you all so much for your amazing responses! And Sherry, I don't know where to begin thanking you for finding me and giving me this opportunity to voice a little more of me! Thank you for doing this interview with Sherry. Together you moved me. I too had a calling to teach, and loved seeing the "light in their eyes." Retired now, I'm reaching into writing as if trying on new clothing. These are very inspiring words, "My dream is now. May it linger." I now imagine visiting you on the ocean, a retreat accompanied by sharing and challenges and peace and ocean and critique and walking. Have you considered boosting finances by hosting a small writers' retreat once or twice a year?. Susan ~ Strange you mention a writer's retreat! That was an old dream when I had a beautiful property to offer as a setting in Tasmania! Now? I don't know! There are beautiful venues on my peninsula. One is called Hummingbird ~ an eco retreat not far from me. But there is always the issue of money. A great interview! I have been following Gemma's Songline blog for a long time before I started writing. We participate in a lot of the same photo memes. 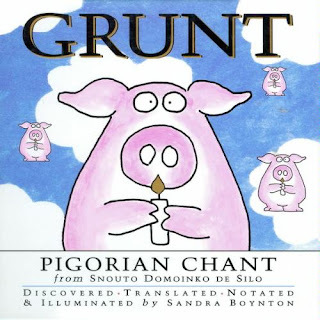 Gemma, your photos and words touch my soul... and you are the only other person I know that listens to "Grunt - Pigorian Chant" I bought that cd many years back! So heartwarming to read these comments of appreciation of this wonderful woman. Gemma, the writers' retreat is a BRILLIANT idea.......perhaps one could begin in a campground setting, and modestly? The eco retreat idea is also a good one. If you have solid pre-bookings, with a cancellation penalty, and a minimum numbr of required bookings, it just might work. I love the way you weave spirituality and writing - perhaps that could be your angle. I wish I had money! I'd come!!!! And so lovely to meet you too Rosemary! Strange how you have ended up in NSW and that is where I began in Sydney. Had a minute on-line and happily got to read this lovely interview... another hit Sherry! Very nice to meet you Gemma and find out more about another accomplished poet ...and how wonderful that you got to go to, and loved, the Tyrell - a museum in Alberta, my home province ... my grandson Jack is all about dinosaurs and I'm hoping when we get back from Europe, we can all go there and see some of their more recent acquisitions and updates ... again, a really wonderful read. Thanks to both of you. Wonderful!! So glad to learn more about Gemma!! Thank you both! !